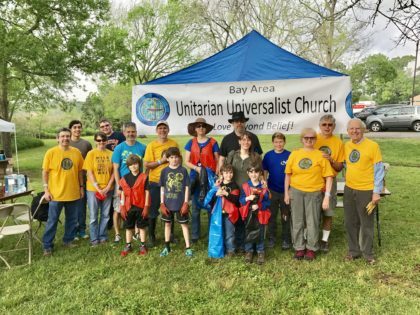 In living out our commitment to change lives and heal our world, Bay Area Unitarian Universalist Church focuses our Service and Justice work in four main areas, and offers regular opportunities for the entire congregation to participate together in making our world a more just and compassionate place for all. Bay Area Turning Point Food Drive: Each November, teams from the church assist in the collection and processing of food donations for this local organization which provides shelter and vital services for those affected by domestic violence and abuse. Family Promise: BAUUC is proud to be an active partner in the interfaith organization called Family Promise of Clear Creek. The program’s goal is to help transition families away from homelessness to permanent housing by providing a safe environment that includes shelter, meals and hospitality. Because of the work of dozens of our church volunteers in 2017, 15 families received shelter and support services. Learn more. Interfaith Caring Ministries Donations: We collect donations every Sunday morning from our members of non-perishable food items and toiletries for the ICM food pantry and store. Look for the big grocery cart in the fellowship hall! Fall Festival for UNICEF: Our annual all-ages picnic and Halloween carnival on the church’s back lawn raises funds for the United Nations Children’s Fund. “Guest at Your Table” Program: During the holiday season, families at BAUUC honor those around the world in need by setting aside an offering each time they have dinner at home and all the monies collected are donated to the Unitarian Universalist Service Committee. UUSC promotes economic rights, advances environmental justice, defends civil liberties, and preserves the rights of people in times of humanitarian crisis. Children’s Holiday Toy Drive: Donations of toys and gifts for young and adolescent children are collected for City Wide Club of Houston and distributed on Christmas Eve at George R. Brown Convention Center in Houston. International Outreach: Working with our partners at ANSWER (American Nepal Student and Women’s Educational Relief) we provide scholarships for children in India’s lower caste system to attend school. BAUUC is also proud to participate in the FINCA Bank micro lending program to offer small business loans in developing countries. 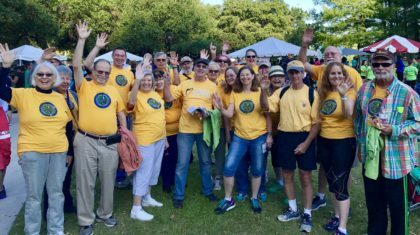 Greater Houston National Alliance Mental Illness Walk: Each spring, our BAUUC Team participates in this walk to support the Houston chapter of the National Alliance on Mental Illness as part of our ongoing ministry of support and advocacy for people with mental illness. Education and Advocacy: BAUUC regularly offers educational programs about mental health issues in order to reduce stigma and increase acceptance. We engage in advocacy work for funding and services to assist those affected by mental health concerns in our local community, our state and our nation. 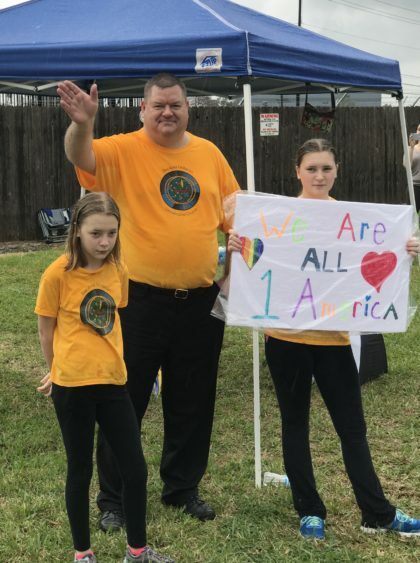 Houston Pride Parade: Every June, BAUUC is proud to join other Unitarian Universalists as we march together in this great Houston celebration. 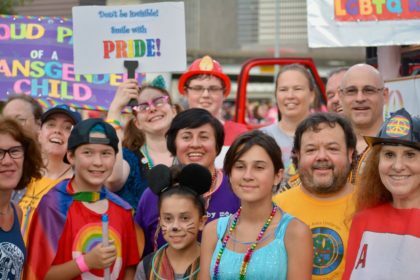 Parents Families and Friends of Lesbians and Gays: The Clear Lake chapter of PFLAG offers peer counseling and support for LGBT people and their families and friends. The group meets at 2:00 pm on the fourth Sunday of each month in our Fellowship Hall. 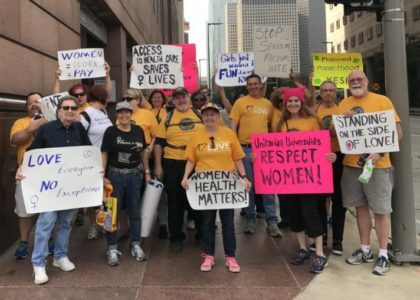 UU Voice for Justice: A network of Unitarian Universalists from across Houston dedicated to being a public voice for LGBT equality, women’s rights and religious freedom. Join the members of our BAUUC community as we publicly witness for justice at events. Learn more. Our Whole Lives: We teach our children, youth and adults respect for all people through our comprehensive sexuality education programs offered each spring. BAUUC has been designated as a “Welcoming Congregation” by the Unitarian Universalist Association. We welcome and value the presence and participation of lesbian, gay, bisexual and transgender people in our church community and congregational life. Armand Bayou Trash Bash: Each Spring, a group from the church joins hundreds of other volunteers from the community to collect trash and help clean up this local park. The Armand Bayou is one of America’s largest urban wildlife refuges. It’s programs promote conservation and help ensure that future generations have the opportunity to experience wilderness close to home. Sustainability & Simplicity Group: We educate ourselves and others about the issues of our environment by sharing resources and ideas on how to eat locally and consume less. BAUUC has been designated as a “Green Sanctuary Congregation” by the Unitarian Universalist Association. As individuals and as a faith community we are committed to living in harmony with the Earth and working towards creating more sustainable ways of being. Share-the-Plate Offerings: Half of all non-designated contributions from the offerings at our worship services on the first Sunday of each month go to a local non-profit organization. Additional Service and Justice opportunities happen throughout the year. Look in our church publications and website for the latest information on how you can join our BAUUC community in changing lives and healing our world.